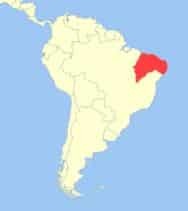 Common Marmosets are native to East-Central Brazil. They can be found in a number of forest habitats including Atlantic coastal, semi-deciduous, Savanna, Riverine, Dry Secondary Forests and Edge habitats. 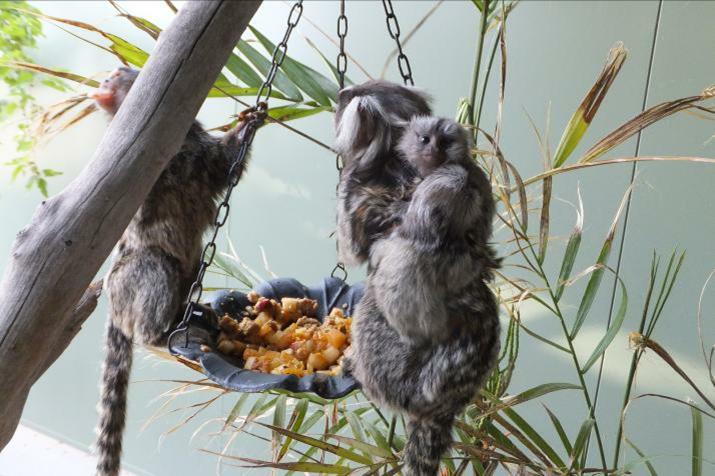 Common Marmosets are relatively small monkeys with long banded tails. Males grow to an average height of 188mm with females growing to 185mm. Their coats are multi-coloured, with mottled brown, grey and yellow markings. They have white ear tuffs and claw-like nails known as tegulaes on most of their fingers with only their big toes having flat nails or ungulaes. 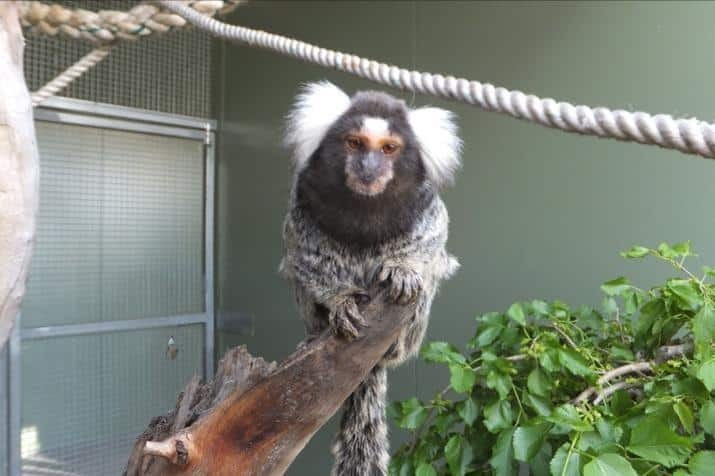 The name of the Marmoset monkey comes from a French word for shrimp or dwarf. Their faces are hairless, but Marmosets do not have the ability to change their facial expressions. Diet: insects, spiders, small vertebrates, fruit leaves, tree sap, and eggs from the nests of birds. Reproduction: Males reach sexual maturity at 1 year old with females taking up to 2 years. Gestation period: 150 days, normally producing twins but occasionally triplets or quadruplets. The dominant female Marmoset usually becomes pregnant within 2 weeks of giving birth. Lifespan: approximately 10 years in the wild and 16 years in captivity. 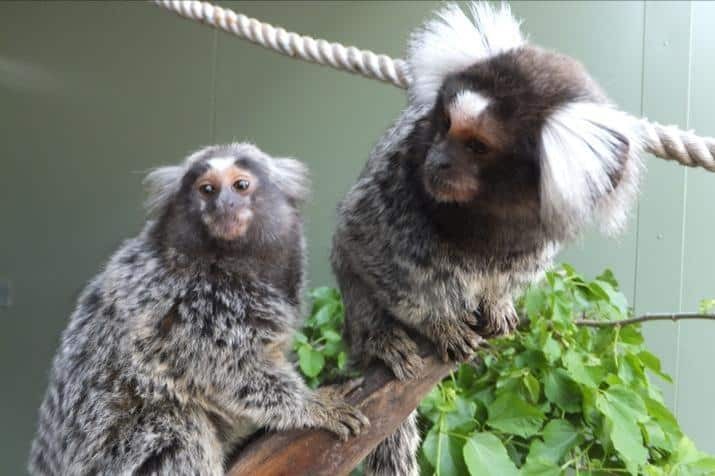 Group Structure: Marmosets are highly social within their group that can number up to 20 individuals and consists of a co-dominant breeding pair and subordinate members. All members of the group assist in caring for the infants including the dominant male. Predators: Weasels; Otters; Badgers; small to large cats, Snakes, Owls, and other large birds of prey.